Rescue your budgeting, planning, and forecasting from slow and painful manual processes with planning software for finance teams proven to improve productivity by more than 70%. 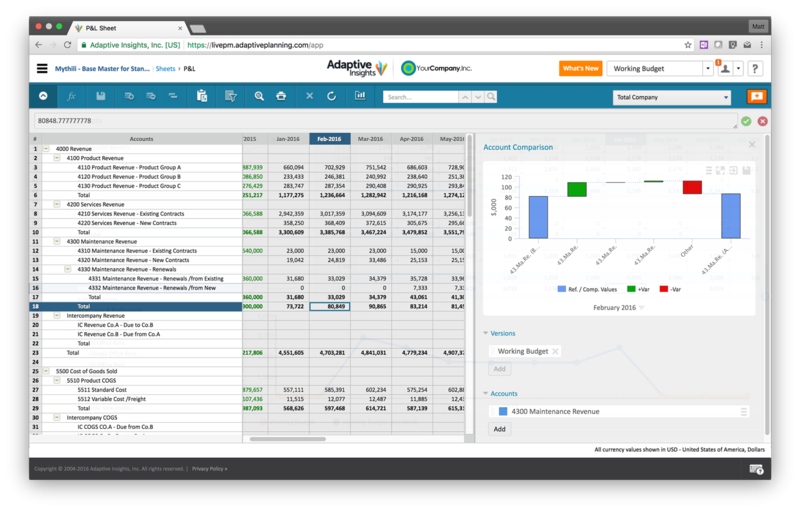 Integrate revenue and expense planning, use rolling forecasts, and analyze performance. Enjoy the benefits of using a cloud-based planning system and work the way you want to work - on the web, in Excel, or mobile. Stop wrestling with static spreadsheets and fixing broken calculations and formulas. Our flexible planning software centralizes budgets, actuals, plans, forecasts, calculations, and cell notes to ensure integrity—from summary to detail. Work from a common data foundation that builds trust and accountability, and ensures that your planning processes scale with your business. That means your team will spend more time analyzing the business and working with stakeholders instead of wasting time uncovering the cause of a dreaded #N/A, #NAME?, or #REF! in their models and reports. 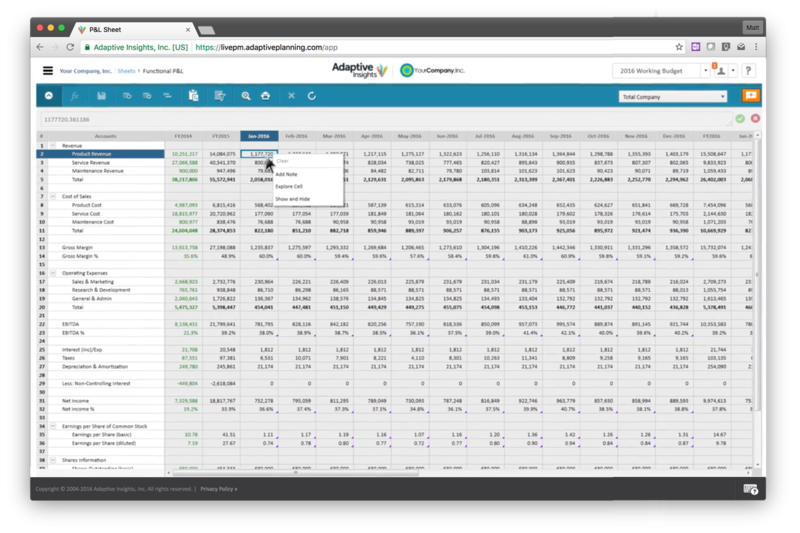 Our built-in cell explorer provides a complete audit trail, so you can see the source behind any value, formula or assumption. From budgeting expenses to creating financial statements and forecasting revenue, Adaptive Planning accommodates all types of modeling—workforce, capital, and revenue—across all industries and sizes. Financial and currency logic eliminates the complexities of departmental and global planning. It’s integrated planning that drives transparency throughout the organization. Our planning and forecasting software enables rolling forecasts with integrated driver-based scenarios that you can tune in real time. With the latest actuals, assumptions, and modules always at hand—and truly responsive calculations and reports—Adaptive Planning lets you proactively manage change, model outcomes, and course-correct at the pace your business demands. The intuitive experience will let you scale your planning processes across your entire organization. 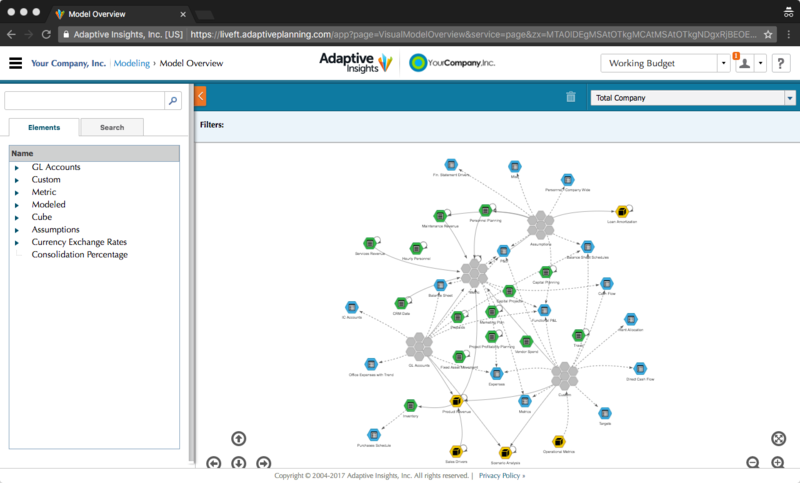 Visual Model Overview allows you to quickly grasp your business model and data flows in a single view. See a graphical representation of your model that dynamically updates with the version and level you select. Understand your model and data flows without clicking through multiple pages. Grasp your overall planning process quickly. Enable new administrators to come up to speed with ease and understand your model in little time. Easily create step-by-step guides for your users, tailored to their specific roles, with links directly to the location in the financial model where their input is required. Simplify the process and help occasional or new users collaborate in each budget and planning cycle. Ensure that business users complete all the necessary planning steps on a timely basis while giving them an experience that is easy and fast. Create formulas that represent the true realities of your business in all its complexity with ease. With extensive business logic and calculations at your fingertips, it’s easy to write, explain, and maintain complex formulas. Write them once and apply them anywhere in your model, wherever it makes sense, whether that's in the planning stages, analysis, or in both. Adaptive Planning is designed with user choice and flexibility in mind. The software offers multiple interfaces made to suit the needs of its users and make it simple to move from manual budgeting, forecasting and planning. 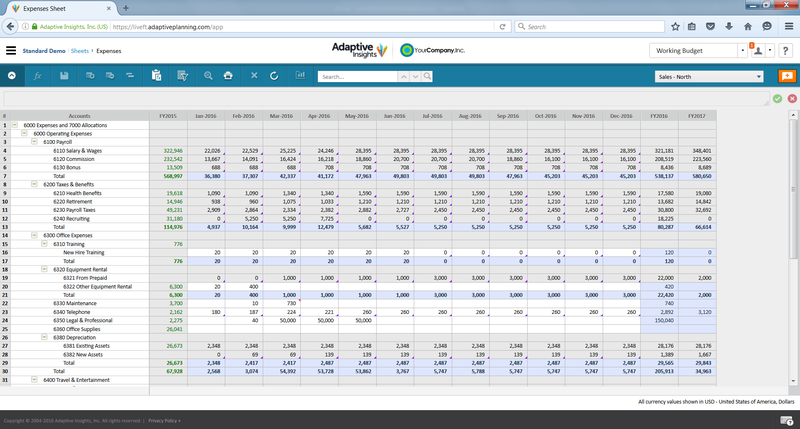 Users can work with our incredibly familiar and easy-to-use, web-based planning sheets that deliver an Excel-like experience with the advantages of working in a browser from anywhere. They can also use our Excel Interface for Planning to take advantage of the formatting power of Excel as well as when they need to work offline. In either case, our solution provides centralized data entry, instantly calculated results, organizational security, and workflow with the goal to eliminate duplicated effort and time wasted consolidating the plan. 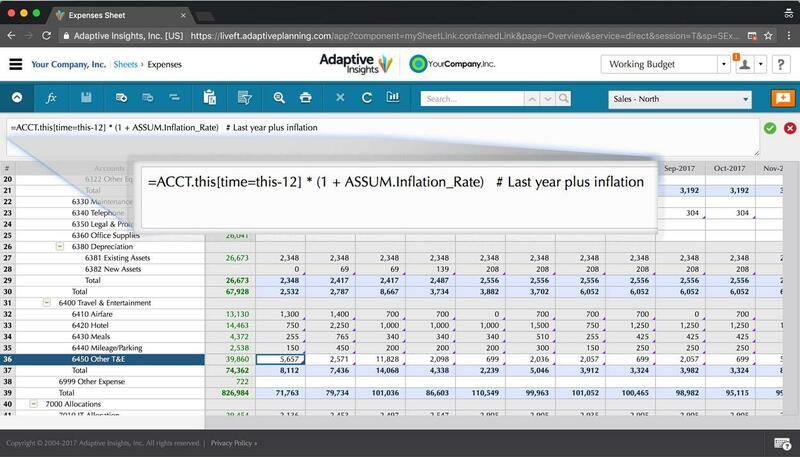 Adaptive Planning is part of the Adaptive Suite, so you can enrich your planning process with dynamic, interactive reports, data visualizations, and visual dashboards—no coding required. Get a view of the entire enterprise—corporate metrics, operational performance, functional KPIs—and immediately adjust plans and forecasts based on visual exceptions and trends. Built-in workflow allows managers to review and approve budgets, plans, and finance professionals to see what’s been submitted and approved. It’s the real-time workflow you need to ensure that everything keeps moving. Track common planning tasks, use discussions and cell notes to collaborate, and monitor changes and issues with a powerful audit trail. There's a reason our budgeting and forecasting software has the highest customer satisfaction ratings. See our planning software in action.